Our dog Harper got out (3/14) around 9pm in the Kern area (university & Kansas) We have not found her yet and are really worried. Please share! Her collar says sally but she goes by Harper. 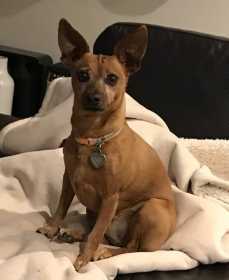 - She is a Miniature Pinscher/ Chihuahua mix - She is chipped - She is friendly but somewhat timid when it comes to new people. - She is a reddish/brown color and has gray hair on her face - She is about 10 lbs. - She is 9 yrs old. She is loved and extremely missed.